The SteelSeries Sensei is back and better than ever. With a new sensor, a few software tricks and improved build quality, this is one of the best ambidextrous gaming mice you can buy. The SteelSeries Sensei is one of the best gaming mice that’s ever existed, next to the legendary Logitech MX518. Over the last decade, it’s been updated with the addition of its own CPU, and has seen a wireless edition released alongside the traditional wired gaming mouse. However, this time around, we’re getting a totally redesigned mouse with the SteelSeries Sensei 310. Not only does the SteelSeries Sensei 310 look much better, but it also features an advanced sensor that you won’t find in other gaming mice. And, despite the major improvements, the Sensei 310 returns it to its roots as an affordable, professional-grade gaming mouse with a modest price tag of $59 (£59, AU$99). At this price point, the new and improved Sensei 301 enters the crowded market of other ambidextrous gaming mice. It sits between the $69 (about £69, AU$99) Logitech G Pro Gaming Mouse and $49 (about £49, AU$79) Razer Abyssus V2. While it is surrounded by rivals, we can confidently say it has no equals after spending a few weeks with the Sensei 310. Although the new SteelSeries Sensei 310 has inherited the underlying shape and eight button layout of its predecessors, it has an unmistakable modern take on the classic peripheral. The typically faux chromed and anodized finishes of yore have been swapped out for a slightly sandy matte coating that's easier to grip. 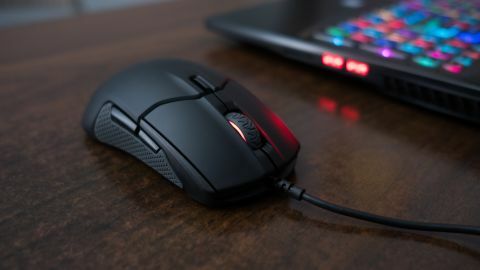 What’s more, the strips of rubber along the sides have been replaced by silicone padding to give you an even more confident hold of the mouse. Weighing in at only 90 grams, we were worried the Sensei 310 might have the same cheap feel and hollowness as the HyperX Pulsefire. Thankfully that wasn’t the case due to the gaming mouse’s solid build quality and the aforementioned sandy finish elevating its texture above everyday, cheap plastic. The SteelSeries Sensei 310 also feels like it has curves in all the right places. The rear of the mouse falls off steeply making it comfortable for the palm to wrap around. Meanwhile, the mouse’s narrow body transitions into a pair of wide hips your fingers will lovingly cling to. Regardless of whether you prefer a claw or palm grip, you should feel right at home with this mouse. The real heart of this updated Sensei lies in its TrueMove3 optical sensor, which SteelSeries engineered in partnership with Pixart – the makers of pretty much every mouse sensor in existence. This exclusive sensor offers a maximum sensitivity of 12,000 counts-per-inch (CPI) and one-to-one tracking at up to 3,500 CPI, to claims the Sensei 310 absolutely delivered on in our testing. Now, plenty of other gaming mice promise to deliver the same impressive levels of sensitivity, but SteelSeries has also added advanced jitter reduction. This smooths out any tiny micro-movements from your hand, so we can actually land headshots with Widowmaker and Hanzo in Overwatch, while our hands are shaking from excitement. With most other mice, we’ve seen our crosshairs jump around like a hyperactive chipmunk, but that’s really due in part to our unsteady hands. If you run into the same issue, you should give this mouse a whirl. The SteelSeries isn’t the cheapest ambidextrous gaming mouse you can pick up, but for its build quality, comfort and astounding sensor performance, it’s well worth splurging the cash on. It’s the perfect gaming mouse for those just entering the hobby. With the mouse being designed for professional gamers, this will have the legs to help you grow, not to mention the 50-million click lifespan to see your potential career through. And if you're right-handed and looking for a comfortable mouse, the SteelSeries Rival 310 is the ergonomic twin of the Sensei 310 down to the same price, materials and sensor.